New Botox techniques: MicroBotox, Mesobotox. Revance RT001. Botox was originally FDA approved for treating stabismus (lazy eye) and blepharospasm (spasms of the eyelids) in 1989. When treating around the eye, patients and doctors were noting the wrinkles around the eyes were improving and brows were elevating. Studies were then initiated by Drs. Jean and Alastair Carruthers to test the cosmetic effects of Botox. It actually took 4 years to recruit enough patients to complete the study. In 2002, the first indication for Botox cosmetic use in the glabella (frown line) was approved. Botox has since become the most popular cosmetic procedure in the world. Its no downtime, consistent and effective results have made it a mainstay for people desiring a quick wrinkle improvement. Earlier this year, the FDA approved the second indication: for use in the lateral canthal rhytids (crows feet). Although the crows feet and other areas of the face and neck have been used (legally) off-label since the early 2000’s, this new approval will allow the company, Allergan, to market this new indication to the public. This will create more public awareness about what Botox can do, and make it even more popular. The newest buzz about Botox is a technique that has been used by Dr. Weiner for several years is called “MicroBotox”. This is when the diluted Botox is injected in multiple very small doses in the area treated. The theory here is that the effects of the Botox are more evenly spread over the areas treated and the chances of having areas over treated is less. The most notable area for this technique is in the forehead. The result of MicroBotox is a more natural look which is not frozen and the dosage of Botox is less. This technique has also been described for use in the neck by a Korean physician at a recent meeting. It was shown to mildly improve the neck wrinkles and improve the texture of the skin. For some people who have recalcitrant acne problems, MicroBotox (sometimes called “mesoBotox” when used in this situation) can be injected very superficially into the facial skin. 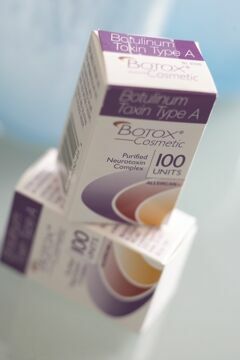 However, there is a risk of affecting facial muscles and Revance’s RT001, a topical “Botox”, should be a better alternative to this technique. In the near future, a cream to apply a substance similar to Botox will be FDA approved. Revance Therapeutics is developing RT001 for use in the lateral canthal rhytids (crows feet) and has shown great promise. It will be a cream which is applied in the physicians office and stays in place for about 15-30 minutes. This will eliminate injections for this area and is completely painless. The results seem to be impressive, possibly better than injections. The reason the results are better is similar to why MicroBotox is better for the forehead- the dosing seems to be more evenly applied to the muscles around the eyes. Other areas being tested by Revance are: underarm hyperhidrosis (sweating), migraines, and rhinitis (runny nose). Off label potential uses are for acne and general overall skin improvement of the face and neck. Unfortunately, the other areas which Botox is injected in, frown lines and forehead line, have muscles which are too deep to allow the topical ingredient to get to those depths. Whether or not the upper lip lines (smoker lines) will be treatable with RT001 has yet to be tested. Even though Botox has been FDA approved since 2002 for cosmetic uses, there are still new techniques, new uses (approvals), and a new delivery model (topical) for a competitor which will soon get approval. The aesthetic industry is constantly changing and Dr. Weiner works hard to stay at the forefront of all the latest techniques and technologies. To learn more about Dr. Weiner, visit his website: http://www.theclinique.net For a consultation call: 850.622.1214. Dr. Weiner is a Facial Plastic Surgeon who devotes 100% of his practice to noninvasive and minimally invasive cosmetic procedures. His practice is called the Aesthetic Clinique and is located in Santa Rosa Beach, which is between Destin and Panama City Beach, Florida. ← Don’t Forget The Hands and Decolletage When Thinking About Your Cosmetic Refinements! I am 37 years old. firstly i didn’t think of having botox treatment. I am afraid of having it but, after treatment i love what this treatment done for me. I am happy. Before this treatment i didn’t know about alternative of this. Thanks, for providing. Next time i definitely going to use this and if it makes me what i want then this is the best.